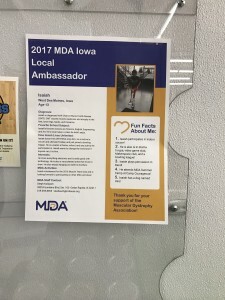 Isaiah Dale, 7th-grader at South Middle School, was named an Ambassador of the Muscular Dystrophy Association (MDA) for his contributions towards the MDA and courageous attitude. 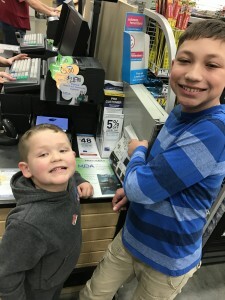 Isaiah was diagnosed with Charcot Marie Tooth Disease (CMT) July of 2015 at the University of Iowa Children’s Hospital. CMT causes muscle weakness and atrophy in the feet, lower legs, hands and forearms. He underwent genetic testing to narrow down what specific type of CMT he has. There are over 70 different types of the disease, all affecting the body in different ways. Last year Isaiah attended Camp Courageous, a summer camp sponsored by the MDA, where he was nominated by the camp directors to be a local Ambassador for the Muscular Dystrophy Association. 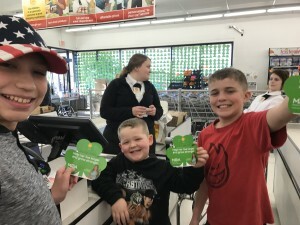 He was officially named an Ambassador in February when a family friend and MDA representative surprised him with the award during his school lunch. In addition to becoming an Ambassador, Isaiah is also the captain of team #IsaiahStrong which took part in the 2017 Des Moines Muscle Walk at Principal Park April 29. He also inspired his mother to run the Chicago Half Marathon this May. So far the team has raised over $2,500 for these events combined.